How are Marches, More Gun Laws, and Dissing the NRA Going to Keep Our Kids Safe? The anti-gun crusaders have stooped to new lows; using our kids to try and push a hopeless agenda which will do absolutely nothing to keep them safe. As a mom, I am utterly and completely fed up with Hollywood starlets, manic-media, multimillionaires, and spineless politicians who attack the NRA and cry for more gun laws but never even consider discussing the root of the problem they have actually created. 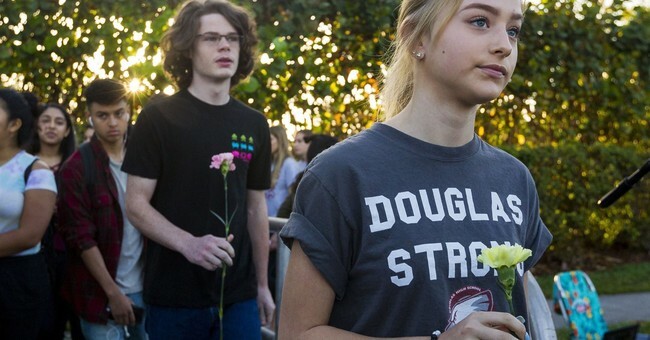 On March 24th, youth from the Florida high school, where 14 students and three staff members were killed, will descend on Washington D.C. in yet another march protesting the constitution. Kids around the country are holding “walk outs” and “sit ins” demanding more gun laws, but they have no idea what they’re asking for. They have an excuse to walk out of class without getting in trouble because the adults aren’t acting like adults and telling them to get back to school. In the greatest twist of irony, the pink-hatted feminists from the Women’s March who continue to wail for their right to kill their own offspring are big supporters of the March for Our Lives movement encouraging students across America to “walk out” and even giving them instructions on how to do it. Hollywood elites have donated $2 Million for the kids’ “March for Our Lives” in Washington D.C. They will no doubt be joined by kids all over America in the call to rip the Constitution to shreds. Of course, the kids don’t know that’s what they’re doing, because they aren’t taught the Constitution in school anymore. We don’t even teach American history anymore—we teach a diluted form of propagandist history. This is the same old play we’ve seen time and again from the destroyers of liberty—only this time, they’re using our kids. And I have no doubt teens will show up in mass to get their day in D.C. They’ll get to hob nob with the rich and famous, get their 15 minutes of fame, and go home with a T-shirt like a rock concert, but it won’t take away the Second Amendment, and it won’t do a darn thing to keep our kids safe—in fact, it does the exact opposite. I commend the young Florida student who stood up and said enough is enough, and I understand their need to speak out and “do something” to stop this madness. I’m angry too. I too want something done. But unlike those who would use your kids to promote their agenda, I want to do something which will actually make a difference. So, as a mom who is fed up with the violence and tired of being afraid to send my kids to school, I am introducing a big dose of common sense into the conversation. We are in triage mode. We must address the root of the problem for this to stop. But right now, we have a desperate situation which requires a massive defense against these mass killings so our kids are safe now! Then we can focus on root causes and long-term solutions. Anyone who has any common sense at all would realize posting signs which read “Gun Free Zone” are big, bold, neon invitations to any crazed lunatic wanting to go on a mass killing spree. So why in the heck would you post these signs in front of our children’s schools? First order of business—take down those signs! The problem with the Florida school shooting wasn’t that there were too many guns—it was that there weren’t enough. Police don’t prevent crime. We do. The average police response time is 10 minutes. Do you know how many people you can kill in 10 minutes? I can empty my clip in less than one. It’s time to get serious about protecting our kids. There are plenty of teachers and staff who would willingly volunteer to carry a gun to school. Of course, it would be completely voluntary and implemented on the local level—not a federal one. It’s our kids being targeted. We are the ones who have the right and responsibility to speak out on what we feel is the best solution to protect our kids. They are not the nation’s kids, the government’s kids, or the school’s kids. They’re ours! If George and Amal Clooney and their Hollywood elitist friends really want to do something to protect kids at school, they’ll put their money into protecting our children the same way they protect their own—with armed security. The only other option at this point is a mass exodus from public schools where are kids are no longer safe. Once we have these things in place, we can start focusing on the root causes no one wants to talk about, and the obvious, tangible solutions everyone wants to avoid. Let’s start with a fundamental fact—guns don’t kill people. People use guns to kill people. A gun can’t walk into our children’s school and autonomously start shooting. And yet, it is always the gun media focus on when mass shootings happen—completely ignoring the person. It’s time we stop focusing all our attention on the gun and look at the people doing this and find out why because the answers are there. Our culture is creating an environment toxic to our kids, creating confused, depressed teens who too often become disconnected parents and dysfunctional adults. Fatherless homes have been a common factor. Bullying has played a role. Violence in video games, TV, and movies has proven to have a negative effect on our kids, literally changing them to think and behave more aggressively. You combine these things together and it is the perfect recipe for disaster. If we want long-term, tangible solutions to these devastating events and put an end to this senseless violence, then we need to start in our own homes. Dads need to be present and parents need to check in. Home is the place to save America. It is the breakdown of the home and family which has caused this, and it is strengthening the home which will end it. You won’t hear that from the Hollywood elites or pink hatters at the March 24th protest. It will be all about taking guns away from people who never hurt anyone, while continuing to make money on films laced with violence and exempting themselves from any law which would limit them from protecting their own families. We are a critical time in our culture. Our kids don’t understand what they’re asking for, but someday, they will. Until then, let’s act like adults and be the grown-ups having grown-up conversations about the reality of the crisis we’re facing. Guns aren’t killing our kids; our culture is.